I have yet to buy the perfect amount of bananas or apples. Pretty much every time I either run out or have fruit over ripening in the bowl. It doesn’t help that my toddler likes to take a bite out of an apple and leave it on the table, only to then take a bite of another one and leave it the next time she wants one. In my effort to not waste food I’ve been getting creative with how I deal with these expiring fruits. So far I’ve made some amazing cinnamon applesauce out of all the apples and I’ve been experimenting with different kinds of banana breads. My main hurdle has been that I don’t want to add sugar or too much fat to them. Sure, I could make an apple pie or traditional banana bread, but it’s full of added sugars and I’m trying to keep it healthy here! Since I always have a ton of these two fruits I figured, why not combine them into one awesome bread. This recipe the outcome! It has no added sugars, no added fats, all the health benefits of oatmeal and it even gets a bit of extra protein from the egg. 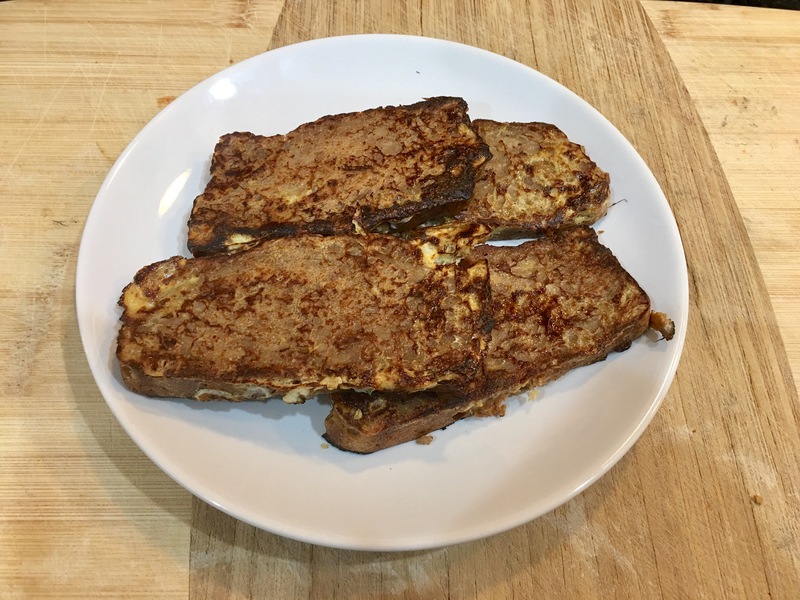 French Toast made with the bread. Yumm!! Homemade Applesauce from apples which were about to turn. I added a stick of cinnamon when I made this and left it in during storage. So this had a nice, rather strong, cinnamon flavor. 5 Overripe bananas. These were frozen since I wasn’t quite ready to make banana bread when they were turning. You can use any overripe bananas though. I will say, I find it’s easier to just freeze bananas as they turn too ripe and then pull out 5 at a time for bread. Rolled oats. These are my favorite brand but you can use any you like. Whatever you do, don’t use quick cook or instant oats. They will throw off the liquid to dry ratio. The steel cut oats will also not work well here since they won’t have time to get soft during the cooking. 3. Place applesauce, Bananas, Egg, Oats, Vanilla Extract, Baking Powder and Salt in a mixer or a large bowl until the bananas are fully broken down and everything is well incorporated. 5. Place in pre-heated oven and cook for 90-120 minutes checking periodically. It’s done when a toothpick comes out pretty much clean.